Cream together butter and sugars for about 30 seconds. Beat in egg, vanilla, and milk. Add the dry with the wet ingredients and beat, be careful not to overmix. 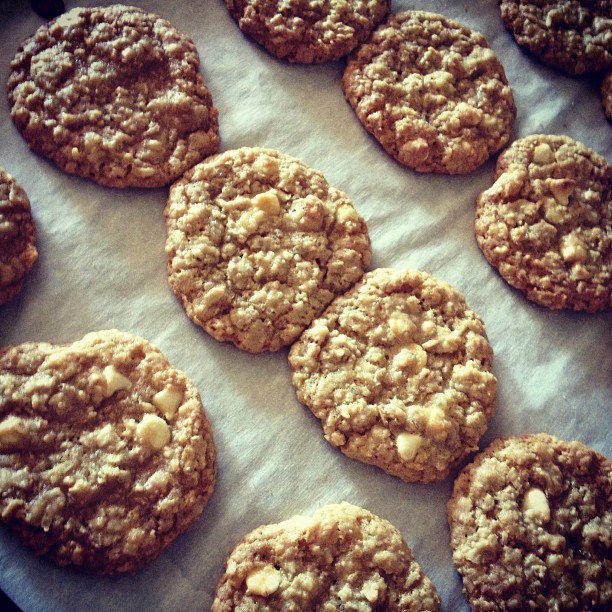 Add oats, coconut, and white chocolate chips. Drop by rounded teaspoon (or medium sized cookie scoop) onto ungreased cookie sheet (I always prepare my cookie sheets by putting parchment paper on them, and dropping the dough onto the paper, less mess and no sticking). ** The recipe I used/modified (from the container of Coach’s Oats) said that it would make about 3 dozen cookies, with the cookie scoop I used, it made about 2 dozen. The original recipe did not call for white chocolate or macadamia nuts, and did not toast the coconut.